Back-to-school season means an onslaught of ads, articles, posts and pins about all of the things we should be doing to get our kids ready to return to school. While there are many aspects of back-to-school time that have gotten overblown and overcomplicated, the one that continually sends me over the edge is the topic of kids’ lunches. 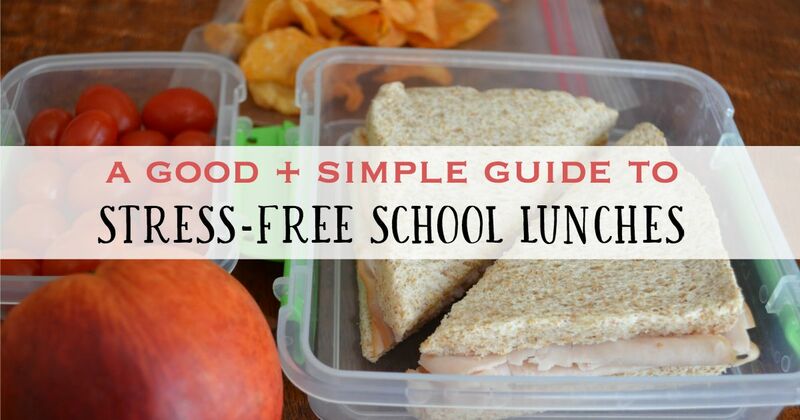 What killed me the most was when I googled “simple school lunches” only to find recipes for asparagus and gruyere paninis and BBQ chicken sloppy joes. 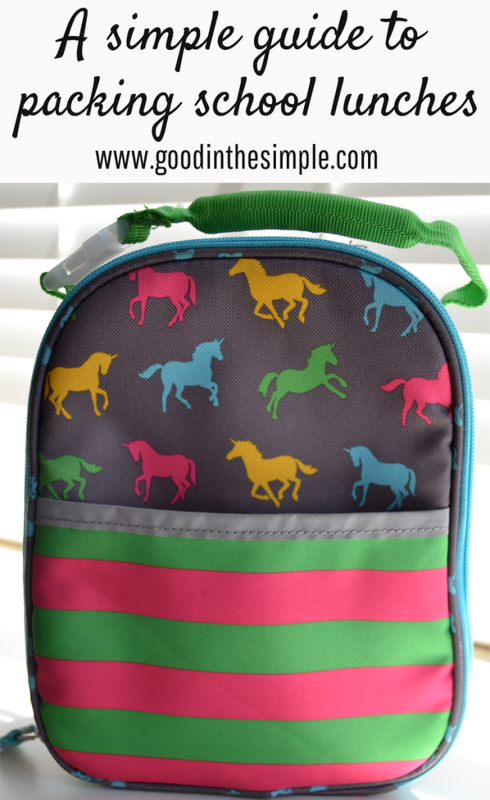 What should I pack in my child’s lunch? Keep in mind that a healthy school lunch is nourishment, not art. My girls don’t need their lunch to have a face. They do not need to have a completely different lunch every day for 30 days. They can wipe the jelly off of their chins with a plain old paper towel. Their lunchtimes will be fun because they will be chatting with friends and going out to recess; their food does not need to be fun. 1) Pack something you know they’ll eat. I was recently talking to another mom about school lunches, and she said her son asks her to pack the exact same vegetable soup in a thermos for him every day of the week. She was feeling guilty about the fact that he eats the same lunch five days a week. You know how I think she should feel? Awesome. He knows what he likes. It has nutritional value. And HE EATS IT. Not all kids will be that easy to please, but most kids have a fairly short list of things they consistently like to eat for lunch. Pack those things. Don’t overthink it or feel like you need to be inventive. If your kids are content eating the same things over and over, feel lucky that your job is that much easier and you know they are leaving the lunchroom each day with a full belly. 2) The prep and packing of lunches shouldn’t take more than 5-10 minutes. Melt cheese onto a slice of ciabatta bread, cut into strips and serve with a side of tomato sauce. Create “build your own tacos” by packing chicken, diced tomato, lettuce, and salsa in individual cups and serving with tortillas. It’s hard enough to get my girls dressed, breakfasted, groomed, and out the door by 7:15 each morning without spending a bunch of time making and assembling their lunches. I want to be able to either make their entire lunch the night before or throw it together quickly in the morning while they’re eating breakfast. 3) Make sure their lunch has nutritional value. When my daughter was in kindergarten and I was volunteering in the lunchroom, I saw a little boy open a lunch box containing nothing but two full-size packages of M&Ms and some juice. That lunch was essentially a big “screw you” to everyone who had to interact with that boy for the rest of the day, particularly his teacher. My girls eat well at home, so I don’t feel the need to pack every single food group and nutrient into their lunches. I do, however, want to make sure they’re getting a good balance of carbs, proteins and veggies/fruits to keep their blood sugar regulated and give them the stamina and energy they need to feel their best at school without running out of steam or getting hyper. With the aforementioned goals in mind, I sat down with my girls to come up with a list of lunches that would be acceptable to all of us. From there, we created a Monday-Friday “lunch menu” that we would stick to throughout the year. Of course this does not need to be set in stone (and you’ll see that Friday is listed as a “wild card” day), but it gives us a general guideline so that the girls know what to expect on any given day, and I know exactly what I need to have in stock for the week. Friday: repeat of Tues/Weds or wild card (ham sandwich, soup, pasta salad, tuna sandwich, hard-boiled eggs, leftovers, etc). 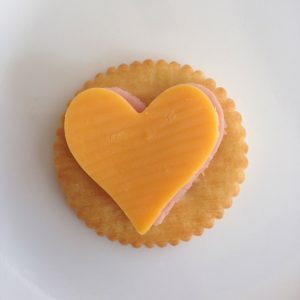 *To make homemade lunchables, just cut out small pieces of meat and/or cheese and serve with crackers. (Please don’t judge me for my heart cookie cutter…it was the only one I could find that was the right size to fit the cracker. I promise not to draw a face on the cheese!). Everyone’s tastes and dietary needs are different, but the key is to sit down with your kids and figure out a weekly lunch menu that you can all agree upon. And then stick to it throughout the year! Of course you can make changes and throw in a special treat once in a while, but having something written out makes it easier to 1) get into a routine; 2) know what groceries you need to buy, and 3) avoid any arguments about what you’re going to pack on a given day. Please share any lunch packing tips or tricks in the comments. I wish you all a happy and stress-free return to school this year! Great article, thank you for the simple suggestions. I pack my kids’ lunches most days and have to say that having the Planetbox lunch box has been awesome! It’s definitely an investment to begin with, but they last for years. My kids are in 4th and 3rd grade and have had them since K. We’ve bought new bags for them, but the stainless steel trays looks like new and no extra parts to be lost. It makes it so simple to pack a good variety, and home-made lunchables work the best with this type of set up. And my favorite part is that they don’t waste any time with wrappers, just unzip the bag, flip the lid and eat! Thanks for the tip, Petra! I’m all about investing in quality products if they’re going to be useful and last a long time.